This review of a Las Vegas restaurant is a break from The Picky Glutton’s usual London-based coverage. Nobhill Tavern is named after the upscale neighbourhood of San Francisco and isn’t some sort of bizarre double innuendo. Established by American celebrity chef Michael Mina, Nobhill Tavern has apparently become more informal and casual over the years. Even though the vague dress code of ‘business casual’ is laxly enforced, it still feels quite formal from the smartly dressed waiting staff to the large, candle lit dining room. The atmosphere isn’t at all subdued though thanks to the constant, bustling stream of gobby diners and upbeat background music. Although service was sometimes a bit slow, it was unfailingly polite, informative, friendly and chatty. Even though I don’t drink, I still got an impromptu tour of the air-conditioned wine storage room after showing only a smidgen of interest in Nobhill’s extensive wine collection. While the bread basket didn’t contain any unusual, inventive breads, it was one of the most well-rounded and tasty selections of breads that I’ve encountered in a restaurant. The crisp, airy ciabatta had a very strong olive oil taste to it, the white rolls had a peppery hint to them and the focaccia was unmistakably infused with a strong dose of rosemary and thyme. 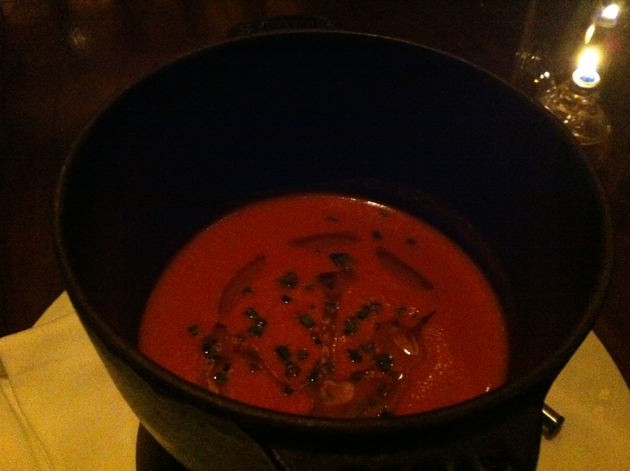 The most intriguing starter available on the evening of my visit was the tomato fondue. Served in a small cauldron set over an open flame, the tomato fondue tasted like a sweet, slightly spicy, but not too creamy tomato soup. Sorry for the gloomy/grainy photos folks. The atmospheric lighting was a photographic pain. 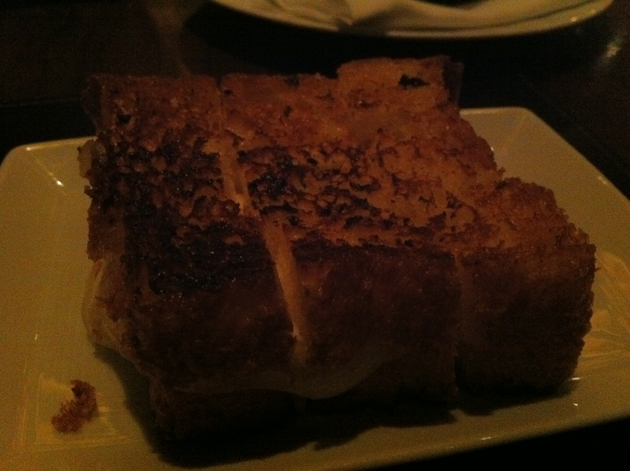 Accompanying it was a grilled mozzarella and provolone sandwich cut into chunks for dipping. Although it sounds unusual, it tastes exactly as you would expect – well-grilled chunks of cheese and bread covered in tomato soup. Despite being nominally Italian, I only ever seem to encounter provolone cheese in the US. It would’ve been fun to have seen raclette cheese in the sandwich rather than provolone as a nod to the original Swiss cheese fondue, but it’s still a fun, if unexceptional starter. Think of it as a posh Welsh rarebit. If that helps you. According to my friendly waiter Michael Mina’s signature dish of lobster pot pie is so popular it’s the only constant on the otherwise seasonal menu. 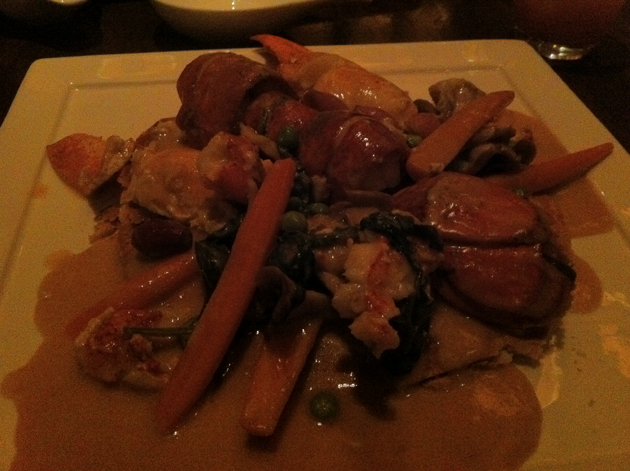 The whole lobster is apparently poached before being placed in a saucepan with the accompanying vegetables, covered in a brandy and cream sauce. The whole thing is topped with a light pastry crust and placed in a hot oven for around 18 minutes. The entire saucepan is brought to your table where the waiter gently removes the pie crust, which serves as a bed upon which the contents of the pie rests. No kitty, this is my pot pie! It may sound odd, but the fresh lobster wasn’t overcooked as I had feared with the tender texture and slightly chewy bite of the crustacean flesh perfectly preserved. Most of the flesh has been extracted from the carapace so there’s little fuss or mess involved. As a whole though, the ‘pie’ seems a bit gimmicky. The pie crust is light and thankfully non-stodgy, but otherwise unremarkable. The anonymous sauce blends into the background and the odd rag tag selection of vegetables, including olives, peas, carrots and shallots, doesn’t really complement the lobster or the sauce in anyway. While it’s an undoubtedly fun dish, the novelty probably wouldn’t last long beyond one or two sittings. I made the mistake of ordering the truffled macaroni and cheese – a mistake since the lobster pot pie was larger than I expected so I didn’t finish it all. 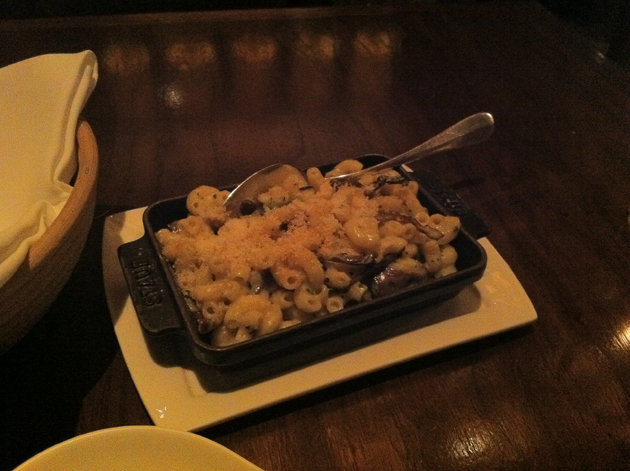 I’ve always thought of mac and cheese as a bland, stodgy comfort food, but it’s a little more interesting here by the addition of the thin slices of slightly chewy, nutty truffle which weren’t as fragrant as I had hoped. There’s a gentle saltiness to it all and it’s not too creamy. While it’s quite tasty, it’s not the barnstorming reimagining of a classic that I would liked to have seen. How come you never see macaroni with anything else but cheese? I usually avoid chocolate desserts in most restaurants now, not because I don’t enjoy chocolate but because they’re frequently done badly. Plus trying to do sometime different with chocolate, that no one else has done before, is far from easy. 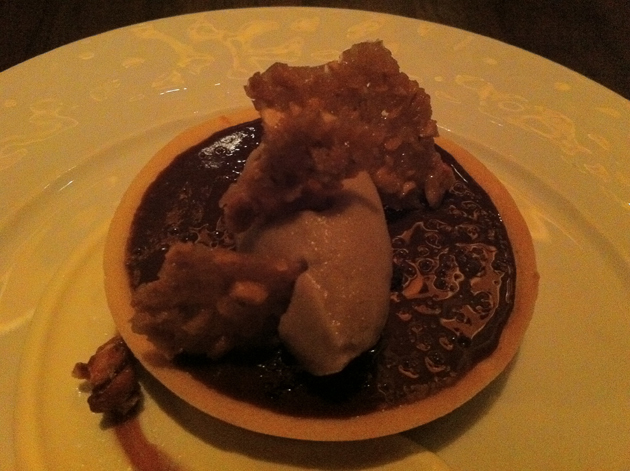 Here, a chocolate ganache tart has been paired with Guinness sorbet and topped with Chantilly cream and peanut brittle. The ganache is smooth and sweet, but it wasn’t as rich or as dark as I was hoping for. There’s no mistaking the boozy Guinness sorbet for anything else though – it’s overpoweringly strong and unbalances the entire dessert. It’s a shame the peanut brittle is relegated to a supporting role – the crunchy, coarse, nutty shards are the most interesting and tasty bit of the entire dessert. I washed it all down with some tart and refreshing grapefruit juice. If it’s not freshly squeezed, then it’s the best grapefruit juice derived from concentrate that I’ve had. Judging Nobhill Tavern is tricky. The food is undoubtedly fun and filling, but the quality of the cooking, while by no means bad by any measure, doesn’t quite fulfil its inventive potential and therefore doesn’t quite justify its high price. Three stars. Opening Hours: Sunday-Thursday 17.30-22.00, Friday-Saturday 17.30-22.30.